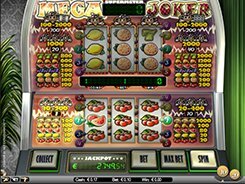 Jackpot 6000 is a NetEnt-powered three-reel slot that offers a classic fun and decent payouts. 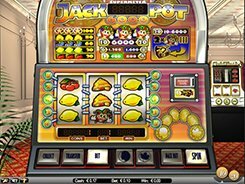 The slot features a traditional tried and tested Vegas style, with 5 paylines and a set of classic symbols. 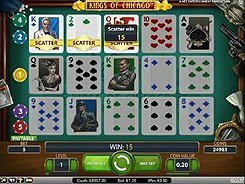 On the reels, you will come across cherries, lemons, grapes, bells, stars as well as the jackpot-triggering Jester. The maximum bet you can place per spin is $10, with a coin size adjustable from $0.1 to $1. There is a Supermeter mode that can be activated by clicking Transfer and then Spin button. In the Supermeter mode you have a chance of winning a 6000-coin jackpot (or $12,000 if playing at the maximum bet). To win the maximum prize, you need to hit three Jester symbols on an enabled payline. Alternatively, rolling up two Jester symbols on a bet line pays out a mystery cash prize with some odds of winning the said jackpot amount. After any winning spin you are invited to gamble all or a part of your win in the Heads or Tails feature. PLAY FOR REAL MONEY!